With export activity in over 60 locations around the world, ALUMINCO is committed to continuous research and development new or improved product solutions that meet quality, aesthetically and functionally on demanding and rapidly evolving markets. For this purpose ALUMINCO, has enriched its potential with well-known strains, particularly in the field of research and development of new products. Our belief is that, in times of crisis, innovation is a unique option. By placing the development of new innovative products continues to invest funds and uses new technologies and fully integrated production and processing procedures of profiles and systems. The painting process of ALUMINCO's products is based on specifications of QUALICOAT and SEASIDE CLASS (class coastal processing), While quality management system complies with ISO 9001 and environmental management system according to ISO 9014. 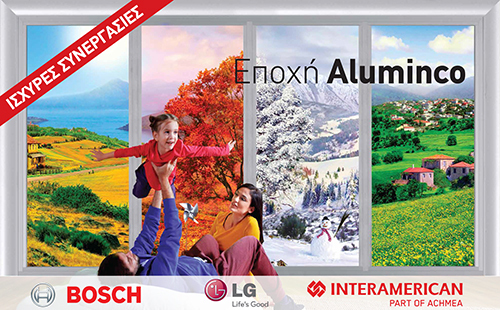 All aluminum profile systems are designed, developed and tested in the research and Development Department of the company and then certified by accredited institutes and international organizations, such as the IFT Rosenheim (Germany), the Instituto Giordano Italy, Greek Aluminium Development Center (Greece) e.t. Providing expertise and technical support, with the use of modern tools in combination with internal training courses and external courses, lay the Foundation for the dissemination and sharing of knowledge in order to maximize the value of ALUMINCO's partner. 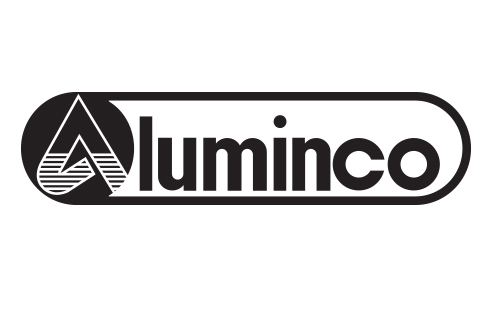 ALUMINCO constantly improves its systems with new design and technological innovations, while making it compatible with the ever-evolving needs of its clients. ALUMINCO's technical staff are fully trained and technically knowledgeable enough to provide integrated technical services in the field of selling and the implementation of a project. 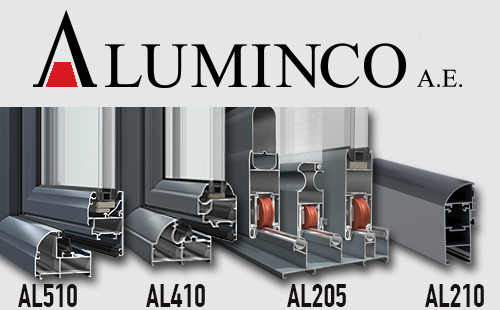 ALUMINCO leads the developments in the field of aluminium, continually upgrading our services and products that offers with complete solutions that meet the needs of modern construction and improve the quality of life, creating trusting relationships with the technical world and the general public. 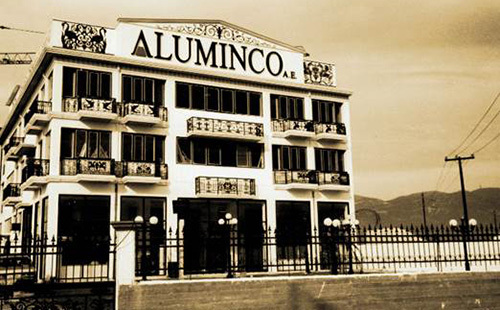 Our History ALUMINCO S.A. is a pioneer, healthy, familial aluminium industry that changed everything in its field. Company's main characteristic is the wider range of certified products in the marketplace, combined with human and efficient service. Since its establishment in 1982 the purpose of ALUMINCO is the innovative activity in the field of research, development and production, of aluminium products with high quality and aesthetics. 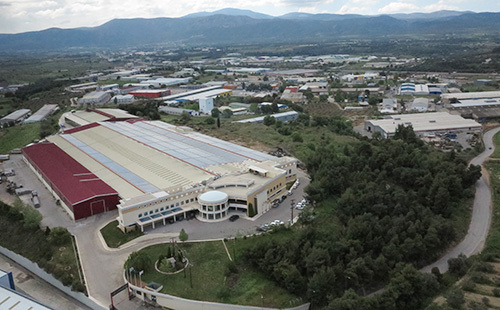 By this choice ALUMINCO progressively became one of the most respected and recognizable company among the leading Greek and worldwide aluminium industry. ALUMINCO was the first company that created a new generation of products of cast aluminium in classic designs, by providing successful solutions for every architecture application. ALUMINCO’s distribution network serves the key markets of Europe, Africa, Asia and U.S.A. distributing ALUMINCO products globally, in more than 60 countries. Today, ALUMINCO has become an integrated full services aluminium industry which processing aluminium in three ways: Extruding: with a production capacity of 13,000 tonnes of aluminum profiles annually. Doors: with a production capacity of 70,000 panels per year. Casting: with a production capacity of 1,000 tonnes per year. Environment To provide sustainable products, ALUMINCO makes every effort to reduce any negative environmental impacts resulting from production processes. 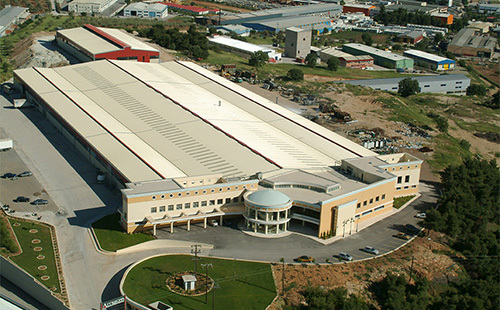 In this effort we have implemented an effective environmental management system according to ISO 14001.The effectiveness of the system is ensured by the use of raw materials that are environmentally friendly, the low consumption by promoting renewable energy sources and the systematic management of waste generated by the manufacturing process. Use Of Raw Materials Main concern of ALUMINCO is the use of raw materials which are environmentally friendly and 100% recyclable. The main raw material used is aluminum, which is an ecological material of natural origin, non-toxic, 100% recyclable, in order not to have a negative effect on health and the environment. Energy consumption and renewable Constant pursuit of ALUMINCO is searching for ways to reduce energy consumption, including energy recycling and reuse solutions at local sites. Addressing the issues of energy we proceed promoting renewable energy in all our operating procedures. Indicative, we mention that our coa photovoltaic power system 1.2 Mwp at owned facilities on industrial property to the Prefecture of Viotia. 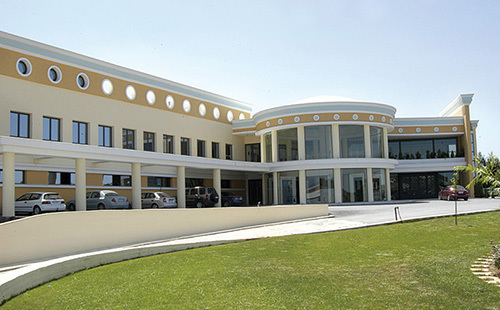 The cooperation with the Greek electricity company for the sale of "clean" energy held on 26 May 2012. In the first year the annual production was 1,750, 400 kWh of electricity, equivalent to the annual consumption of about 481 households. Regarding the environmental benefits of the project, over 1,700 tons of carbon dioxide (CO2) were saved annually. Recycling and waste During the actual recycling process only a small percentage of the metal has turned into aluminum oxide. The recycling process itself requires only about 5% of the energy consumed for the production of primary aluminium. Because of this, a 95% energy and reducing emissions can be achieved. At the same time, the garbage collection, sorting, storage and processed is being done in cooperation with authorized certified companies, through an effective waste management system. ALUMINCO's commitment, is the search for solutions, with very limited impact on the environment, that provide the most appropriate Visual, technical and sustainable solution in the areas of construction. 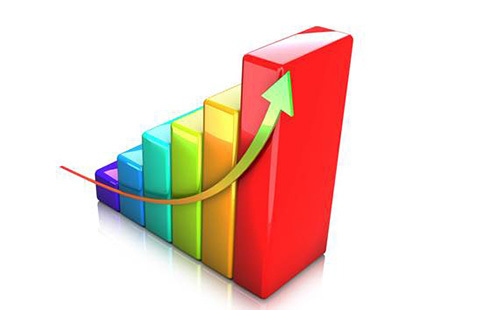 Quality The purpose of customer satisfaction in every aspect, ALUMINCO follows consistently a quality policy which main objectives are: • Ensuring high quality of the products and services, with the technical and quality characteristics arising from the formulated needs of the market. • The continuous improvement of the quality and characteristics of the services, but in general the quality in all processes and manufacturing processes of the company. 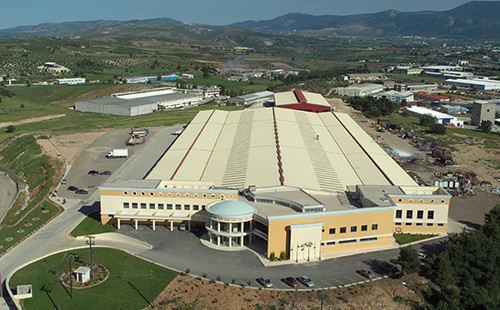 To achieve these goals contribute effectively the quality system that ALUMINCO applies since 1996 (one of the pioneers in Greece), using effective design and monitoring methods of successfull quality and standards, at all stages of production and supply of products. Under the quality system and the wider policy of quality, ALUMINCO: • Systematically explores developments in the aluminium industry on issues related to the needs of its customers. • Selects Suppliers with internationally recognized Product Quality • Ensures the required manpower and the necessary technical infrastructure • Systematic staff training on issues of competence and urges the establishment of "Quality Culture"
• Planning, adopts and monitors the application of the indicator system quality and Efficiency Targets, with the ultimate goal of optimum control and optimization of service processes • Controls the proper implementation of the quality management Procedures & Processes • Notifying this policy to all staff and ensure continuous upgrading, so they are always compatible with their overall corporate goals.